Green Tea and Capsicum (Cayenne) may help to maintain a normal weight. Caffeine may help to increase alertness and concentration. Brazilian Cocoa Prep - (Cocoa Extract, Colour - Caramel (Sulphites), Caffeine, Maltodextrin), Caffeine Anhydrous, Capsicum (Cayenne) Extract, Capsule Shell - (Hydroxy Propyl Methyl Cellulose, Colours - Azorubine Carmoisine and Patent Blue V), Green Tea Leaf Extract, Guarana Prep - (Guarana Extract, Colour - Caramel, Caffeine, Maltodextrin), Niacin (Nicotinamide), Acetyl (N) L-Carnitine, Maltodextrin, Black Pepper Extract as Bioperine. 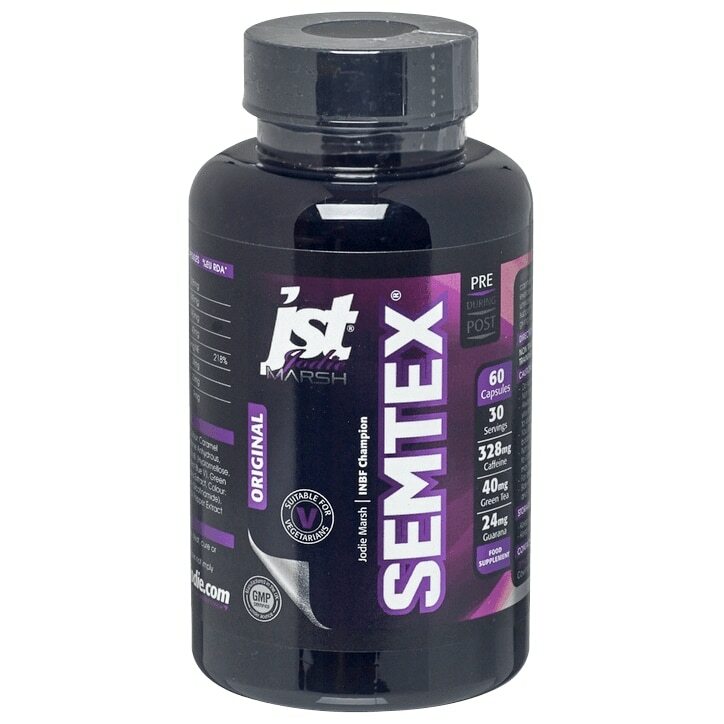 JST Jodie Marsh Semtex Capsules is rated 5.0 out of 5 by 3. Rated 5 out of 5 by Chantelle from Love them! I love these. I've been using them for about two years now primarily as a pre-workout supplement, I take two half an hour before training and they really make me feel energetic and strong, without giving me the jitters. I've tried other brands but always come back to these. Can be a bit pricey but i think worth it after trying cheaper versions. Rated 5 out of 5 by Cathy97 from outstanding product I have been using this product for 6 months now and my training has gone through the roof!!!! Amazing stamina and allows me to push further. Rated 5 out of 5 by Lauren from Lauren Genuinely burns fat I have used these on and off for two years since they first came out and I always lose more weight when I start using them again - gives you loads of energy as a kick start to your work out - I usually take them 30 mins before I leave work so by the time they start to kick in you actually want to go to the gym rather than waste the energy and just go home.